(Bloomberg) -- Leading retailers are poised to secure a tax reprieve of as much as 400 million pounds ($519 million) after appeal judges ruled business rates shouldn’t be imposed on cash machines in shops, the Press Association reported. Supermarkets including Tesco Plc, J Sainsbury Plc and the Co-operative Group on Friday defeated the government’s bid to impose separate rates on hole-in-the-wall cash machines after the Court of Appeal ruled in their favor. The court also ruled against any appeal by the Valuation Office Agency to take the decision to the Supreme Court, though the government could still launch a petition on the matter, according to the PA report. 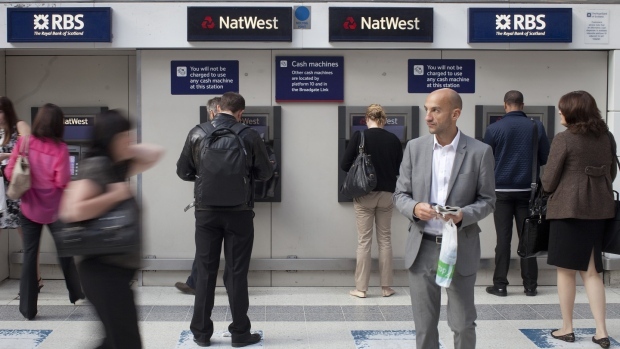 Shops were facing a 44.5 million-pound bill this year for ATM rates in England and Wales, and 181 million pounds over four years as per the 2017 business-rates regime, it said, citing data from real-estate adviser Altus Group. U.K. retailers are already under threat from rising real-estate costs and the boom in online shopping. U.K. Chancellor Philip Hammond’s 2018 budget measures that slashed business rates faces an uphill battle to reinvigorate the beleaguered British high street, according to Bloomberg Intelligence.